Bev Hogue’s In Your Dreams painting for Hive Gallery Oct. 3, 2015 opening in L.A.
It’s another trip to L.A. but this time with a twist. For the opening at Hive Gallery’s “Secret Art of Animators 2” show on Saturday, Oct. 3, I decided to send a representative in my place — an 11 in. x 14 in. acrylic on canvas painting titled In Your Dreams. The show highlights the artwork of the movers and shakers of the animation industry. Among the featured guests: Simpsons art director Andrew Brandou, Model maker Tory Bellici (The Matrix) and Mythbusters host and M5 model maker Kari Byron, among many others. I was asked to submit a piece for the accompanying show that plays on ’90s animation favourites. Ren and Stimpy were too hard to resist. They pose (as still as they can possibly be) American Gothic style, bookending a portrait of one of my blue women. She has the expression of one of my favourites, Deer Prudence. I like the piece and I hope it goes to a good home. 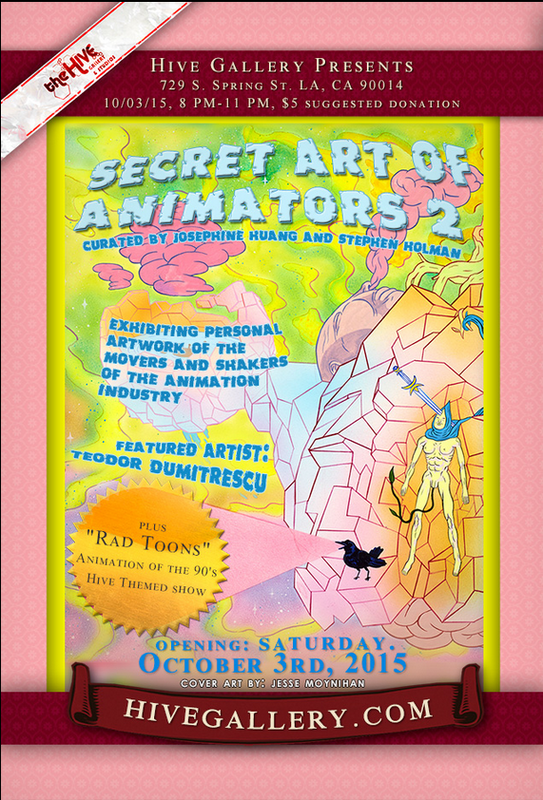 Secret Art of Animators 2 show at Hive Gallery in L.A.